This article describes the inner structure and organization of the elements which build the RadLinearGauge control. 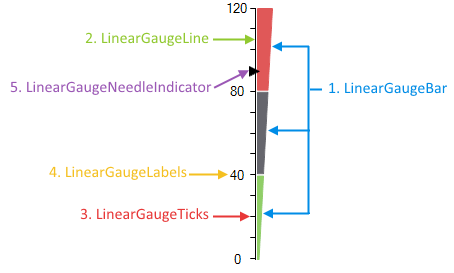 LinearGaugeBar: This element represents a bar that can be used for indicating a specific value or as a scale for other indicators. LinearGaugeLine: This element represents single line which can be used with the ticks. 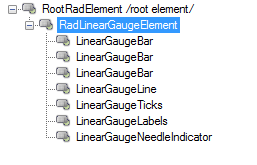 LinearGaugeTicks: You can show a scale with this element. LinearGaugeLabels: Allows you to show labels next to the scale ticks. LinearGaugeNeedleIndicator: this is an indicator that points to a value.